From 1901 to 1908, the current Orange Line used to share the Green Line tunnel under Tremont Street. The outer tracks were used by rapid transit trains, and the inside tracks were used by streetcars. The streetcars would loop or turn around inside the subway at Park Street on the south side, and Scollay Square on the north side. When the Washington Street Tunnel was opened in late 1908, the Orange Line shifted under Washington Street, and all four tracks in the Tremont Street Subway were exclusively used by streetcars. A strange subway accident occurred on August 5, 1906. A northbound train became disabled at Haymarket Station, and all the passengers disembarked from the coaches. 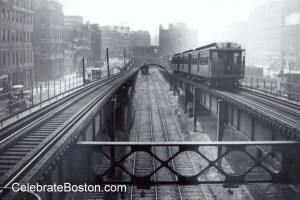 The train headed up the old elevated incline near North Station and suddenly stopped, and then rolled back back down into the subway and collided with another train. Many passengers were thrown from their seats and a train operator was significantly hurt. The accident was very unusual in that the train had both air and hand brakes, but the operator was unable to stop the cars in time to avert the collision. It is fortunate that more people were not injured, as the old coaches were made of wood, and had open platforms on each end, called vestibules. The August 6, 1906 Boston Globe describes the accident: "Shortly before 7 o'clock yesterday morning a northbound elevated railway train became disabled in the subway through some defect in the motor and its passengers were disembarked at a station and told to wait for the train following. Then the crippled train was started for the repair shops at the Sullivan-sq terminal, but on the upgrade from the subway to the North station the power on the empty train gave out entirely and the train ran rapidly back down into the subway and at a point almost directly under the City hospital relief station. It crashed into motor car No. 075 of a loaded passenger train, causing a wreck. The rear vestibule of the runaway empty was crushed into something resembling kindling wood, and the left half of the front vestibule of the head car on the loaded train was broken and splintered, pinning in the motorman, who was trying to reverse his power and lessen the shock of the collision he had seen was impending. Several windows in each of the cars which came in contact were broken and the passengers in the second train were severely jarred, some of them being thrown from their seats. The only thing which saved the life of the motorman of the second train was the fact that the collision occurred on a slight curve, which threw the brunt of the impact with the car ahead on the left-hand half of the vestibule in the front of his car. The collision disabled both trains and the passengers on the second train were helped from the cars and guided back to the Haymarket-sq station of the road, the railway employees standing guard over the third rail until all the passengers were out of the way. They all reached the station in safety and were given transfers to the surface lines. All the elevated trains in the subway, northbound at the time of the collision were run to the nearest stations, where they discharged their passengers and transfers to the surface cars were given out. There was a great deal of confusion, delay and annoyance as a result, because there were not enough surface cars in commission to take care of the crowds in the rush hours, and many people were obliged to walk despite the heat. Traffic on the northbound line in the subway was suspended for over an hour before the wrecking crews got the damaged trains in shape to be pulled out and taken to the repair shops in Charlestown...."